David Corr lives in Chorley with his parents and older brother Chris. He happens to have Down’s syndrome. He went to local primary schools and then Astley Park School in Chorley. He now attends Cardinal Newman College and is studying Foundation Skills. David is a very happy and enthusiastic person who embraces life to the full. He has always taken whatever life has offered him and used every opportunity to fulfil his ambitions. David comes from a sporty family and has fully embraced this. At the age of 5 he began skiing and now skis as part of Pendle Race Squad attending local and national races around the country. He is representing the North West Region in the National Inter-regional race. He also joined the Rossendale Special Olympics Ski club when he was 13 and now skis for them and has been fortunate to be chosen to represent Great Britain at the World Special Olympics Competition in Austria in 2017, where he won the slalom gold medal! David also plays football and belongs to Jigsaw in Bury and Masters in Bolton; both clubs helping people with learning disabilities. He loves playing and competing and his favourite position is goalie. He also loves attending the gym to build up his strength for all the sports he enjoys. He also likes going on family bike rides. When David was young he always enjoyed music and would dance to anything he heard. As he got older he wanted to learn more and spends hours watching all types of dancing especially street and hip hop on You Tube and films. His favourite films to watch are ‘Street Dance – the film’ and the one by Diversity. He attended different dance classes but they were not what he really wanted. 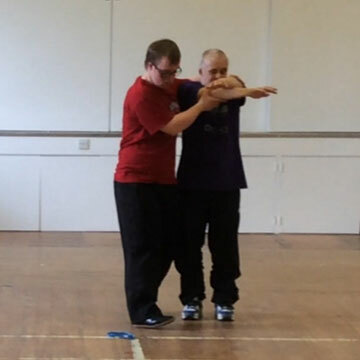 David then heard about Dance Syndrome through someone at college. It sounded exactly what he wanted and he attended the Dance by Example training course to enable him to teach others. He was then asked if he wanted to join the core group to learn and perform dances. He loves to perform and within a few weeks of joining the group he was on stage at the Lowry Theatre! He has also used his skills to teach a group of boys to perform a dance at the end of year celebration at college. As for the future; David is not sure what he wants to do but is certain that he wants to carry on dancing, skiing and playing football. Possibly something to do with sport or dance. He also wants to leave home and live in a house where he can have a dog! !